Normally paint thinner is used to remove oil-based paint from brushes, rollers, equipment, and surfaces. However, there are many other applications and uses for paint thinner saving you money and time. This article presents some of the most common uses for thinner and others that might surprise you as well. Let's check them out. Paint thinner can be used to clean your equipment and tools once you have finished your job, especially when you have been using oil-based paint. Paint thinner can also be used to 'thin' or reduce the viscosity of paint so it can be used in sprayer applicators. Another important use that most people are not aware of, is that paint thinner can be used to prevent paint from hardening when it has been left open. Paint thinners should not be used with latex paints, shellac or lacquers. Before getting a paint thinner, you need to know that there are different paint thinners for specific applications. Oil-based paint and latex paints will require different products to thin the paint. Read the manufacturer's recommendation on how to use the right ratio of paint to paint thinner. The mix shall be prepared carefully adding the thinner slowly and mixing it thoroughly. Normally, a ratio of 4:1 paint to thinner should be a good one. You don't want to have it thinner than paint, as it will deteriorate and affect the quality of the paint. Do note that if you are using a sprayer, the mixture has to be thin so it can flow through the gun. Never use cold paint as it might affect the thickness and application process. Thinner must be mixed with paint stored at room temperature. Use a wooden stick or spoon to stir the paint while you add the paint thinner. Before starting, test the mix, by applying two coats on your surface. Make sure that the paint is not dripping either is too thick. Mix slowly making sure that the thinner is being properly mixed. When using custom color paint, make sure that paint for all different pails are being mixed in a single pail, so the color outcome is consistent. Remove chunks of paint that cannot be mixed with the thinner. If you have added thinner to the paint and is still too thick, try adding a little bit of water to it, only if it is latex paint. Never leave the paint thinner can open for too long, as it will evaporate. Thinner shall be applied slowly until desired results are obtained. 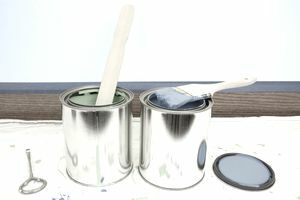 Normally, paint manufacturers provide recommendations on the amount of thinner to be used, but normally they don't exceed the 4:1 paint to thinner ratio. If for some reason you have added too much thinner, then the paint might shade when applied and you will have some problems once you have completed the work. Remember that spray paint, or if using a sprayer, paint needs to be even thinner to avoid clogging the machine. If you need to use paint thinner, always remember to wear appropriate PPE, at a minimum, gloves, goggles, and respirators. This last one is very important as thinner will release fumes that could be absorbed and ingested through absorption and respiration. This type of product needs to be stored carefully, preferably in open spaces. Avoid working with thinner in closed or low vent areas and try to use mechanical ventilation is working indoors. It is also recommended to have a fire extinguisher nearby as solvents can be extremely flammable. Never dispose of thinner neither paints through the storm sewer or the ground, it will contaminate it. Don’t fill containers of solvent all the way to the top. Their vapors need room to expand, and an over-full container can potentially burst.